You love your pets because they are your best companions. But when one of them messes on the carpet, it can be a bit of hassle to clean up. Then you have to worry about the stain left behind. But, you don’t want to have to call the carpet cleaners everytime a stain appears on your carpet. So, save that extra money and clean it up yourself. It’s actually not that difficult to get small stains out of your carpet, especially if you find them right away. If you have pets, you will inevitably deal with an accident at some point. And, if you’re unsure how to clean up that potty stain, then you’ve come to the right place. In this article, we’re discussing how to get pet stains out of your carpet. Don’t fret, it’s only a minor stain. Once you know how to clean it up, you won’t have to worry about the next time it happens, either. The trick is to have all the right supplies on hand so that you can get to the stain as quickly as possible. The sooner you get to your pet’s potty mess, the less time it has to soak into the carpet fibers potentially creating a stain. But, even if you have an old stain, you might be able to pull it out with some of these tricks. Here’s how to get pet stains out of your carpet. The first step to removing a stain should be to thoroughly clean up the pet mess. To do this, you should consider using a tool, like an old spatula or putty knife and a pair of rubber or latex gloves. You’ll also need paper towels and a trash bag. With your gloves and paper towels, pick up any excess from the floor and place it in the trash bag. Now, using your cleanup tool, try carefully scraping the mess up from the outside, in. Be careful not to dig in order to prevent the mess from driving deeper into your carpet fibers. Once the excess has been removed, you’re ready to clean up the smelly stain. Next, if you haven’t already, it’s time to gather your supplies. You can always use a solvent specifically designed for pet stains, but they don’t always get the stain completely out. Besides, you probably have everything you need, already. Once you have all of your supplies in order, you can create the proper mixtures to use on your stain. You’ll need to mix about 3 tablespoons of Oxi-Clean with warm water in your first spray bottle. Add a few drops of Dawn dishsoap and 2 tablespoons of hydrogen peroxide to the mixture. You’re finally ready to tackle this stain! Take your spray bottle full of cleaning solution and spray it liberally on the stain. Allow it to soak for at least five minutes. Using one of your clean rags, blot the stain carefully. Do NOT rub. Try working from the outside of the stain, inward, to prevent the stain from spreading into other carpet fibers. Keep blotting until your rag is wet and use more than one if you have to. You should be using a rag with a clean surface to pick up the stain. Rinse the area well with clean, cold water. 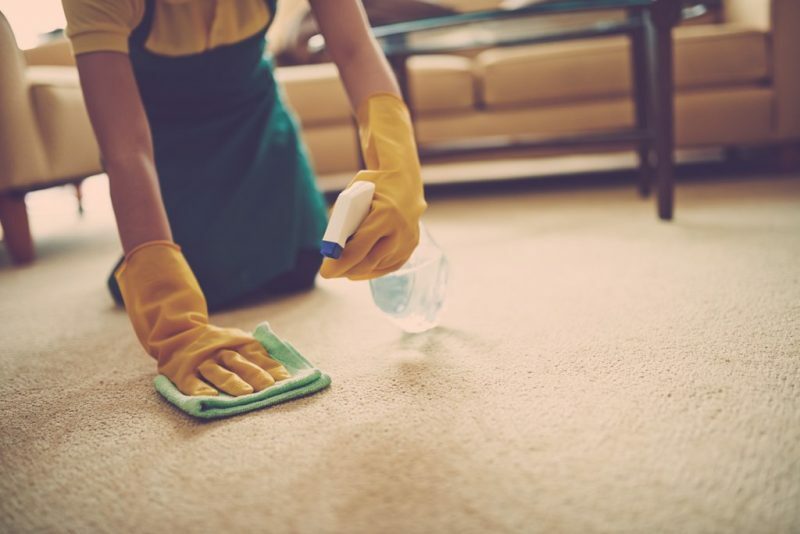 As an extra preventative you can scrub deeper into the carpet to remove any stain that could appear later. Using your bristle brush, scrub the spot of the stain until you see soap suds lifting out of the carpet. If you don’t see soap suds, keep blotting with the wet rag and soapy water and continue scrubbing until you’re sure the stain is removed. Now, you can dry the stain. Blot again, this time using a clean, dry rag. Remove as much of the excess moisture as possible. The next step is to deodorize the stain so it doesn’t smell when it dries. This could also help to prevent your pet from having another accident in the same spot. Fill your other spray bottle with distilled white vinegar and spray it on the stain liberally, until it’s noticeably wet. Allow it to sit for at least five minutes and then blot dry. There is no need to do this more than once. Once the stain has completely dried, you’re ready for the last step. Simply sprinkle baking soda over the stain, covering it from edge to edge. Allow it to sit for at least 12 hours. When the baking soda is completely dry, you should notice it crystallize and perhaps turn color. This is a good sign. It means it’s working on the last stitches of that stain. Finally, vacuum up the baking soda, and wallah! That’s how to get pet stains out of your carpet! Quit searching for how to get pet stains out of your carpet and get to it. Now, you have all the resources you need to to get those pesky stains out for good. All you need is a little bit of elbow grease and some patience. Your floors will be looking new in no time and you won’t have to hassle with the mess or smell anymore. Just don’t forget the baking soda! If you need more than just spot cleaning, or if you have questions, contact us. We’re the leading choice for carpet cleaning in our region.